Because of its definition of affordability, beginning next year the Affordable Care Act may affect retirement savings. Employer contributions to employee pension plans are exempt from payroll and personal income taxes at the time that they are made, because the employer contributions are not officially considered part of the employee’s wages or salary (employer health insurance contributions are treated much the same way). The contributions are taxed when withdrawn (typically when the worker has retired), at a rate determined by the retiree’s personal income tax situation. Employees are sometimes advised to save for retirement in this way in part because the interest, dividends and capital gains accrue without repeated taxation. In addition, people sometimes expect their tax brackets to be lower when retired than they are when they are working. These well-understood tax benefits of pension plans will change a year from now if the act is implemented as planned. Under the act, wages and salaries of people receiving health insurance in the law’s new “insurance exchanges” will be subject to an additional implicit tax, because wages and salaries will determine how much a person has to pay for health insurance. While much about the Affordable Care Act is still being digested by economists, they have long recognized that high marginal tax rates lead to fringe benefit creation. And the Congressional Budget Office has concluded that the act will raise marginal tax rates. Were an employer to reduce wages and salaries (or fail to increase them) and compensate employees by introducing an employer-matching pension plan, the employee is likely to benefit by receiving additional government assistance with his health-insurance costs. The pension contributions will add to the worker’s income during retirement, except that the income of elderly people does not determine health-insurance eligibility to the same degree, because the elderly participate in Medicare, most of which is not means-tested. Take, for example, a person whose four-member household would earn $95,000 a year if his employer were not making contributions to a pension plan or did not offer one. He would be ineligible for any premium assistance under the Affordable Care Act because his family income would be considered to be about 400 percent of the poverty line. If instead the employer made a $4,000 contribution to a pension plan and reduced the employee’s salary so that household income was $91,000, the employee would save the personal income and payroll tax on the $4,000 and would become eligible for about $2,600 worth of health-insurance premium assistance under the act. (The employer would come out ahead here, too, by reducing its payroll tax obligations). Even though the Affordable Care Act is known as a health-insurance law, in effect it could be paying for a large portion of employer contributions to pension plans. This has the potential of changing retirement savings and the relative living standards of older and working-age people. By adding significantly to benefits for unemployed people without commensurate additions to the incomes of workers, the 2009 American Reinvestment and Recovery Act (a.k.a., "stimulus law") changed 100 percent taxation from a rare circumstance to one that presented itself to about five million household heads and spouses. If Congress had heeded the advice of those calling for a "bigger stimulus," as many as 13 million people would have made more unemployed than they would as workers. Watch this 19 min video to see how such high implicit tax rates became reality. It happens in Japan too (ht Austen Bannan). A widely held belief: "[The poor and unemployed] will spend a large fraction of any aid, and therefore transfers to that group will have a much bigger multiplier effect than, say, tax cuts for the rich." The exact words are from Professor Krugman, but many others believe it. Where is the research that supports the claim that transfers to the poor and unemployed have a multiplier effect on GDP? Where is the research that supports the claim that transfers to the poor and unemployed have a multiplier effect on aggregate employment? Empirical research would be best. A theory would be interesting too, as long as the theory were complete in terms of recognizing that the funds have to come from somewhere. Irrelevant Reply #1. Theoretical research by Woodford, Rebelo, Werning, Krugman, Eggertsson, and others on what they call the "government spending multiplier". Those authors really mean government purchases, which are quite different from the transfers I'm asking about. If nothing else, GDP by definition includes government purchases but does not include transfers. Irrelevant Reply #2. Empirical estimates of the "government spending" multiplier. As far as I know those studies measure government purchases (esp Department of Defense purchases), not transfers, and purchases are quite different from the transfers I'm asking about. Irrelevant Reply #3. Empirical estimates of the consumption behavior of the unemployed (this one is a classic). I am not asking whether the poor and unemployed spending their money differently than everyone else does -- they do. I am not asking whether aid to the poor and unemployed expands the markets for the things the poor and unemployed tend to buy. I am asking about the effects on aggregate GDP and employment, including all of the sectors -- even the sectors that do not disproportionately serve the poor and unemployed. Interesting Reply. This new Keynesian model addresses the question I am asking. Not surprisingly, it finds that the "Keynesian aggregate demand effect" is trivial. The model also features a wealth effect of transfers by assuming, without explanation, that the poor and unemployed's labor supply is less sensitive to transfers than everyone else's labor supply. A new study shows that the impact of federal government regulation might be even more significant than that of federal taxation. I recently wrote about the need for a federal regulation budget, explaining how private-sector activities to comply with regulation do not appear in the official federal budget, while private-sector interactions with tax and spending programs do, in terms of the amount of money they pay or receive. I also pointed to a few first steps to quantifying the amount of regulation. Last week Sam Batkins of the American Action Forum, which describes itself as “a forward-looking policy institute dedicated to keeping America strong, free and prosperous,” released a kind of federal regulatory budget for each of the last several years. The budgets began with the Federal Register, a daily journal of laws passed by Congress, executive orders and federal government agency reports. Government agencies are often required to estimate private-sector costs of complying with those regulations, and Mr. Batkins aggregated those costs (the federal Office of Management and Budget is obligated to conduct a related analysis on a subset of regulations, as you can see in one of its reports). As a daily journal, the Federal Register contains federal government activity during the year, which makes it different from, say, the federal budget for taxes. Much of the taxes paid in 2012, for example, were collected pursuant to laws and Internal Revenue Service rules promulgated in previous years, at which times they would have appeared in the Federal Register. In other words, the 2012 Federal Register might be interpreted as additions and subtractions to the inventory of federal regulations as they stood at the end of 2011, rather than the total amount of regulation faced by the private sector during 2012. Mr. Batkins found that new regulations cost $236 billion in terms of compliance, while regulations rescinded during the year reduced compliance costs by $2.5 billion. He found that more compliance costs were added in 2012 than in any of the other several years in his study. Just as a government revenue budget should not be interpreted as net costs because the revenue makes beneficial spending possible, Mr. Batkins’s regulatory costs should not be interpreted as net costs because the regulations are thought to create benefits, too. Another difficulty with estimates from the Federal Register is that new regulations may partly replace old ones (even though the old ones may technically remain on the books), so one might want to subtract the previous compliance costs of obsolete regulations from Mr. Batkins’s estimate to arrive at the total increase in compliance costs from, say, 2011 to 2012. Other costs in Mr. Batkins’s study are those imposed on state and local governments, which are real costs but largely result in higher taxes for state and local taxpayers. That means Mr. Batkins’s total is really a combination of tax costs and regulatory costs (equivalently, if one were to add tax revenue to Mr. Batkins’s compliance costs, the total would involve some double-counting). A nice feature of Mr. Batkins’s study, and one it holds in common with a budget for taxes and spending, is that it can be examined by type. He finds that “commodities and securities” was one of the largest categories of new compliance costs, largely because of the implementation of Dodd-Frank regulations. Environmental regulations were another large category. The results show that, for good or for bad, the costs of complying with federal regulations are probably accumulating more rapidly than taxes are. WASHINGTON - The American Action Forum (@AAF) will host an event tomorrow, Wednesday, January 23 examining the link between stimulus spending and welfare efficacy. University of Chicago Professor Casey Mulligan will first present findings from his recent paper, “The ARRA: Some Unpleasant Welfare Arithmetic.” Following the presentation, AAF’s Director of Fiscal Policy, Gordon Gray, will moderate a discussion on the paper’s implications between Jared Bernstein of the Center on Budget and Policy Priorities and key contributor to the design of The ARRA and Shannon Mok of the Congressional Budget Office and lead author of a recent CBO report on effective marginal tax rates on low and middle income workers. RSVP here. Watch live online here. Panel discussion will include time for audience questions. For press inquiries, contact Noelle Clemente at nclemete@americanactionforum.org or 240-888-7310. Watch the 28 minute video offering an overview of the main arguments and results from The Redistribution Recession. The magnitude and distributional effects of the tax exclusion for health insurance look quite different when viewed from the perspective of the entire safety net. Expenditures on health services, especially those made through employer-sponsored health-insurance plans, are largely excluded from a host of taxes. The tax exclusions affect both the size of the health-services sector and society’s distribution of disposable income. A typical approach to estimating the size of the health subsidy implicit in the tax exclusions is to estimate the amount of federal personal income tax revenue that is lost because of the income that escapes tax. It’s important to know the amount of the implicit subsidy, because it is directly related to the amount by which the health sector is enlarged by public policy. However, the income-tax approach underestimates the amount of the exclusion, because health services are often excluded from many other taxes. The payroll tax is an important instance: employer-provided health-insurance premiums are exempt from payroll and state personal income taxes, too, regardless of whether the employer or employee pays them. Health-insurance premiums paid by employers on behalf of their employees will escape pretty much anything that taxes an employee’s wages and salaries, because those premiums are not officially considered part of employee wages or salaries. For example, the food-stamp program and Section 8 housing subsidy programs implicitly tax wages and salaries by withholding benefits according to how much a person earns, but for that purpose they ignore employee fringe benefits like health insurance. Health goods and services often escape state sales taxes, depending on the type of good or service delivered or the type of organization delivering it. Many health services are delivered by nonprofit institutions that escape corporate income and property taxes, too. Just as with the housing industry, we vastly underestimate the government’s effect on the health industry if we focus only on the income tax. A good summary statistic for the overall effect of tax exclusions on the health industry would be a measure of the marginal tax rate on earned income that included all the relevant taxes. When an employee accepts a $1 pay cut so that his employer can add that dollar to his health insurance contribution, that overall marginal tax rate would tell us how much of that dollar comes back to the employee in the form of the various tax reductions. I am not aware of a marginal tax-rate measure comprehensive enough for this purpose (it would also need to pay special attention to the Medicaid program and its different treatment of adults and children), but previous studies have taken some useful steps in this direction. The studies find marginal tax rates greater than 50 percent for families above but near the poverty line, which means most of the money they might devote to employer-provided health insurance would come back to them in terms of reduced taxes and enhanced benefits. More study is needed to quantify accurately the government’s effect on the health market. But we can be sure that public policy has served to enlarge the health industry at the expense of others and that previous estimates do not fully appreciate the magnitude of the distortion. Jan 23, 9am at The National Press Club, 14th Street Northwest, Holeman Lounge - 529. "The ARRA: Some Unpleasant Welfare Arithmetic" with commentary from Jared Bernstein (CBPP, and co-designer of the ARRA) and Shannon Mok (CBO). Federal taxes and spending rules were scheduled to expire at the end of 2012, and the American Taxpayer Relief Act, passed last week, established new ones. As a result, it is unlikely that the United States labor market will grow in 2013. It is helpful to summarize the important policy effects on the labor market from workers’ perspectives in terms of marginal tax rates. By that I mean the extra taxes paid (counting subsidies as a negative tax paid) by people when they work compared with when they do not work, expressed as a ratio to total employee compensation when working. Policies that raise the marginal tax rate reduce the reward to working and vice versa. Many government programs contribute to the marginal tax rate, including, but not limited to, the personal income tax. The most widely discussed change in 2013 is that the top 1 percent or so of taxpayers face higher rates of federal personal income taxation than they did in 2012. Most taxpayers do not face higher federal personal income tax rates, and the Tax Policy Center estimates that this tax change in the new agreement increased nationwide average marginal tax rates less than 0.5 percentage point. (Note that the center expresses rates in cash income units, while I express the rates as percentages of total employee compensation, which makes my numerical percentages a bit less, similar to measuring distance in meters rather than in yards.) The Medicare tax goes up in 2013 a bit for a small fraction of the labor force. This was a scheduled part of previous legislation. A table displaying marginal tax rates on different categories of income shows that changes of half a percentage point or so in the marginal tax rate have occurred frequently during the postwar period. The personal income tax increase this year should by itself have a negative short-term effect on employment — but too small to be obvious in the aggregate employment statistics. Because the tax increase is concentrated on people who are more productive and who spend more on a per-capita basis, it will have a somewhat larger short-term negative impact on productivity and spending. The federal payroll tax is greater this year than it was last year, because its temporary cut was permitted to expire. That increase is 1.8 percentage points when expressed as a share of total employee compensation (some of which escapes payroll tax). The payroll and personal income tax increases together have increased the average marginal tax rate by about 2.2 percentage points. What surprised me was that the payroll tax cut was allowed to expire, but the purported temporary extensions of unemployment insurance were not. Unemployment insurance extensions add to the marginal tax rate, and subtract from the reward to work, because they provide income to people when they do not work. Allowing the extensions to expire would have subtracted about 2.2 percentage points from the average marginal tax rate (see Chapter 5 of my recent book) and left 2013 marginal tax rates almost exactly as they were in 2012 despite a payroll tax increase. Instead, the average marginal tax rate has increased about 2.2 percentage points, putting the rates about halfway back to their stimulus law highs in 2010. For this reason, the labor market could give back about half of its admittedly small recovery from the recession, measured in terms of hours worked per capita. Population is expected to grow about 1 percent in 2013, and that growth by itself tends to increase aggregate hours worked and employment. But even when the population growth is added to the marginal tax rate increase, it seems more likely than not that aggregate hours worked and employment will fail to grow during the year. What Does "Health Insurance Cost" Mean? Beginning next year, people without health insurance through their employer will be able to buy it monthly on "exchanges." They are encouraged to buy the insurance, or else face a penalty for each month and family member not covered. Let's suppose for the moment that the penalty is enforced (even though law limits how the IRS can enforce it). By law, people can let their insurance lapse for three months with no penalty. Moreover, they can choose when the three month lapse occurs, and accelerate and/or delay medical procedures to fall outside the lapse interval, without concern for being denied when they restart insurance because of "pre-existing conditions." Arguably, essentially everyone without employer health insurance would find it in his interest to purchase insurance for only 9 months per year, and cram all of their medical procedures into the nine months of their choosing. Medicaid already experiences this phenomenon (namely people enroll if and when they get sick), and Medicaid participants do not pay premiums. Exchange participants will be paying really money. There is no free lunch in the aggregate, so insurance companies will have to increase their monthly premiums by 12/9 so that they collect the same annual revenue from participants. When this happens, do we say that health insurance costs went up by 33 percent? Or that they were constant? If you chose the latter, then you are saying that health insurance costs should be measured by premiums per person, where "persons" denominator includes people who are not currently insured. But then the historical trend for health insurance costs should be measured the same way, and would be less steep due to the fact that uninsurance rates have increased over time. Another problem with choosing the latter is that exchange participants (suckers?) who do not play this game -- they pay their premium all 12 months of the year -- will pay more for health insurance on both a monthly and an annual basis. Both proponents and opponents of the ACA will want to know whether the new law fulfilled its promise of "bending the cost curve," but my guess is that an army of economists will be needed merely to do the measurement -- to measure health insurance costs before and after 1/1/2014 in ways that are comparable. Obamacare goes into full effect in less than 12 months. Any social scientist wondering how the law will affect the markets for health care or labor needs to know the degree to which the policy will be implemented and enforced. Large groups of people don't like Obamacare, so one cannot forecast reasonably based on a model that assumes 100 percent implementation and enforcement. Obamacare would by no means be the first federal law that millions of people disobeyed. But then what's the alternative forecasting approach? To begin working toward an answer, I offer a list of possible ways in which individuals, states, and businesses may undermine the spirit and/or letter of law. I ask readers of this blog to add to this list, in particular as regards to the employer taxes, individual taxes, employer subsidies, and individual subsidies. People who put little value on health insurance and are able to obtain waivers or find other loopholes in the individual mandate will be ineligible for the subsidies and have less reason than compliant workers to change their behavior in response to the ACA's subsidies. Part of the population may not value the insurance options offered by the insurance exchanges, and therefore forgo participation in those plans and thereby forgo the ACA subsidies. and the Internal Revenue Service may lack authority (or otherwise not devote resources) to enforce it. States may fail to set up insurance exchanges, and perhaps thereby make their residents ineligible for premium support and cost sharing subsidies, even those residents who comply with the individual mandate. If the ACA's administration does not come on-line soon enough, even supporters of the ACA may want to see its 2014 provisions delayed for a year. Due to its tight links with personal income tax returns and their basis in calendar years, I expect that a delay of less than 12 months would be undesirable. I am not recommending that people do these things, but rather trying to understand what will actually happen. Do U.S. Welfare Programs have Work Requirements? "Did the Obama administration gut the work requirement for welfare reform? I'm hearing some (Chris Matthews for one) say this is a lie. What is the truth?" If welfare is narrowly defined to be Temporary Assistance to Needy Families, then the point is debatable, although the answer is still probably yes (see this comment). But food stamps is a much bigger program, and for food stamps there is no debate: the Obama administration did eliminate work requirements with its stimulus law and since the law expired has continued to waive those requirements for any state that requests a waiver (about 45 states requested and received). The legislative and regulatory details are in my book The Redistribution Recession. I suspect the debaters you see are talking past each other on the work requirement subject: one side with a narrow definition of welfare that excludes food stamps and the other with a broader definition including food stamps. A key point in my book is that an economic analysis of our current economic woes must consider the government social safety net as a whole. Is 49 a Magic Number? The aggregate amount of regulation is difficult to quantify, but we learn something about it from the number of businesses that choose to have exactly 49 employees. I noted last week that government regulations are not as easily quantified as taxes and spending, because regulation has no budget and no obvious accounting method. Some laws are not enforced, while others have little impact because people would follow them even without the force of a law. The most useful regulatory budget would put a lot of weight on the laws that actually matter. The economists Luis Garicano, Claire Lelarge and John Van Reenen are developing a method to quantify the aggregate importance of employer regulations. They note that small employers are naturally more common than medium-size employers, which are themselves more common than large employers. Moreover, the frequency of employers of various sizes appears in many situations to follow a “power law” of statistics. If you tell these economists how many employers in a given region have, say, 22 employees, the authors can, with the power law, accurately predict the number of employers with 23 employees. The chart below, reproduced from their paper using data on employers in France, shows the number of employers of various sizes. For example, about 10,000 employers in their sample have four employees. 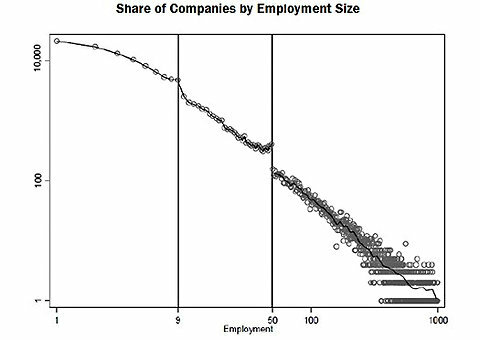 Their paper confirms the statistical power law with one glaring deviation: the exceptional number of employers with exactly 49 employees and far fewer with 50 employees (another lesser deviation occurs on the margin between 9 and 10 employees). The chart shows a couple of odd patterns at the 50-employee mark. First, there are sharply fewer employees (by more than a factor of two) with exactly 50 employees than with exactly 49 employees. Second, although the number of companies usually falls with the number of employees, there are actually more employers with 49 employees than with 45 employees. The authors show how this pattern reflects deliberate efforts by employers to stay below the 50-employee threshold where several employment and accounting regulations take effect. For example, they note that French companies employing 50 or more workers are, among other things, obligated “to establish a committee on health, safety and working conditions and train its members,” whereas companies with 49 employees are not. France also has regulations kicking in at employment levels of 10, 11, 20 and 25. Presumably, companies would not adjust their size to avoid regulations that are not enforced or regulations that require an employer to take actions that he already takes. Moreover, mandates that create costs for employers but create nearly equal benefits for employees should not induce companies to change their size, because (barring minimum-wage regulations) employers can pass on the costs of those regulations to their employees in the form of lower cash wages. The primary reason for size adjustments is regulations that impose costs on an employer significantly higher than the benefits they create for the employees. The larger the net costs, the more company size should deviate from the statistical power law, which is why Professors Garicano, Lelarge and Van Reenen can use their power-law analysis to quantify the private costs of the regulations that kick in at the 50-employee threshold. This is not to say that the regulations imposed on 50-employee companies are necessarily excessive, because they can create public benefits that more than justify their net costs for an employer and his employees, just as taxes and government spending can. For example, an air-pollution regulation might kick in at 50 employees that creates a significant cost for the employer and little aggregate benefit for his employees but creates a significant benefit for the people of France. The authors show how, so far, employer sizes in the United States deviate less from the statistical power law, which implies that French regulations kicking in at 50 are more costly (from the point of view of an employer and his employees) than the United States regulations kicking in at that threshold. But the United States has added some major regulations with its Affordable Care Act and its Dodd-Frank regulations. Beginning this time next year, for example, the Affordable Care Act will put new requirements on businesses with 50 or more full-time employees, whereas businesses with 49 or fewer employees will be exempt. Businesses with fewer than 26 employees may already be eligible for Affordable Care Act tax credits for providing health insurance, whereas larger businesses are not. Perhaps we should thank the French for their heavy regulation, as it is already helping us account for the impact of regulation in the United States.